The QBrand QBlog: When brands collide! Next time you're in the breakfast cereal aisle at your local supermarket, check out new Nestlé Nesquik (as if we needed another chocolate flavoured breakfast food). You're most likely to find it right next to the Kellogg's Coco Pops. 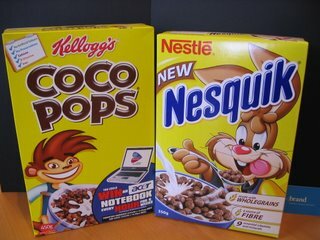 Now compare the two products - Nesquik and Coco Pops (or, in the meantime, just examine our photo). Conveniently, each comes in a 450g box. Each package is predominantly yellow in colour. Each features a zany, brown, "teenage" cartoon character wearing a contemporary T-shirt (the Nesquik Bunny and Coco the Monkey, respectively). Each features a dynamic illustration of a bowl practically bursting with milky, chocolate-y goodness! The similarities are obvious in the context of the cereal category. 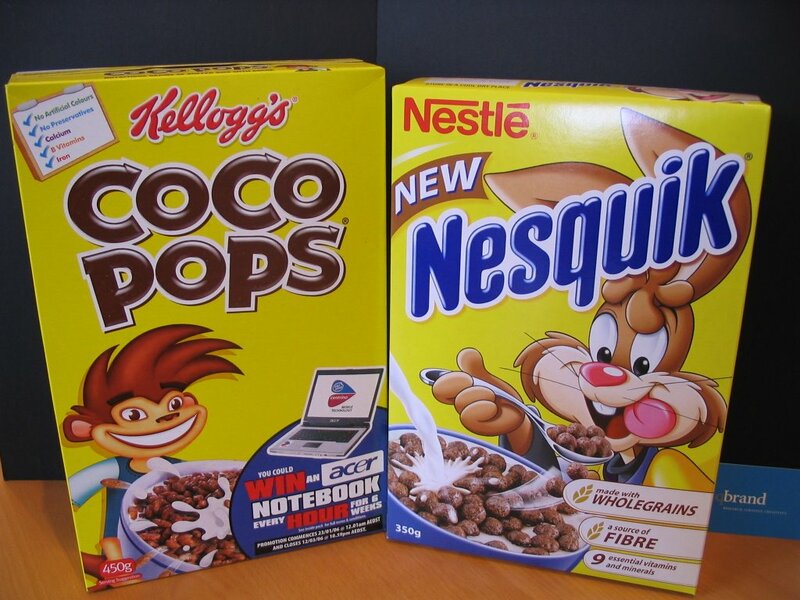 But please don't jump to the conclusion that Nesquik is "knocking off" Coco Pops. First, consider where Nesquik has come from. Nesquik is a very well-known and well-recognised brand name, especially among children and parents. The Nesquik name (or Quik, as I knew it growing up), the yellow colour and the brown bunny are very well established as brand identity elements in the flavoured milk category and have been used in other Nesquik brand extensions. They are also among the logical "levers" for Nestlé to use in extending the Nesquik brand into the breakfast cereal category. It looks like this might be just one of those rare occasions when two brands arrive at the same place at the same time, by accident. Coco Pops has long positioned itself as "just like a chocolate milkshake... only crunchy! ", i.e. cereal moving towards flavoured milk. Through category extension, Nesquik is moving from its base in flavoured milk towards breakfast cereal. In other words, a collision was pretty much unavoidable. Consequently, it seems unlikely that we'll see bowls of Coco Pops and Nesquik cereal being scrutinised as exhibits in the Federal Court. IMPORTANT NOTE: QBrand is not aware of any legal action foreshadowed, instituted or ruled out between any of the brands or parties named in this story. This article should not be construed as providing expert opinion or advice on any such matter.